Most people can contribute to their 401(k) without worrying about exceeding the annual contribution limit. If you're under 50 years old, that's $19,000 a year. If you're 50 or older, it's $25,000. A small, but important segment of the population, though, has the ability to contribute significantly more to their retirement account. For some, a profit-sharing plan combined with a 401(k) ups the saving limit to $60,000. But if you're looking to save even more on taxes or put more into a retirement account, a Cash Balance plan may be the right choice since it offers the opportunity to contribute significantly more to your retirement account each year. Cash Balance plans can help high-income earners build substantial retirement savings in a relatively short amount of time, but they're not for everyone. Unlike profit-sharing plans with discretionary contributions, Cash Balance plans do require mandatory annual contributions. That tends to favor business owners with an income that's substantial and predictable from year-to-year. 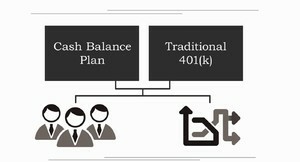 These plans are considered a hybrid between a defined benefit plan and a defined contribution plan. Like many plan designs, they have their own jargon and complexities that sometimes get in the way. But, once you understand the basics of Cash Balance plans, we think you'll appreciate the significant retirement savings and tax mitigation this plan design can provide in the right situation. Business owners like you can take advantage of a Cash Balance plan to quickly make up a retirement shortfall in a tax-efficient way. This can be especially helpful if you're close to retirement age. For example, a 50-year-old could contribute more than $143,000 annually to Cash Balance plan. A 60-year-old could contribute more than $235,000. The actual amount depends on your income and you can also pair a Cash Balance plan with your traditional 401(k) to reward key executives and provide even more plan design flexibility. If you're intrigued by the potential of a Cash Balance plan, let's chat and see if your situation and goals might be a good fit.